Dragon Ball Super will be ending this weekend. Fans of the series are currently walking around with that bittersweet feeling in their gut. The epic conclusion of the Tournament of Power is something that every Dragon Ball Super fan would like to witness, yet it comes at the cost of losing the show. Dragon Ball creator Akira Toriyama has announced a movie that will pick up where the series leaves off, giving fans a sliver of hope. 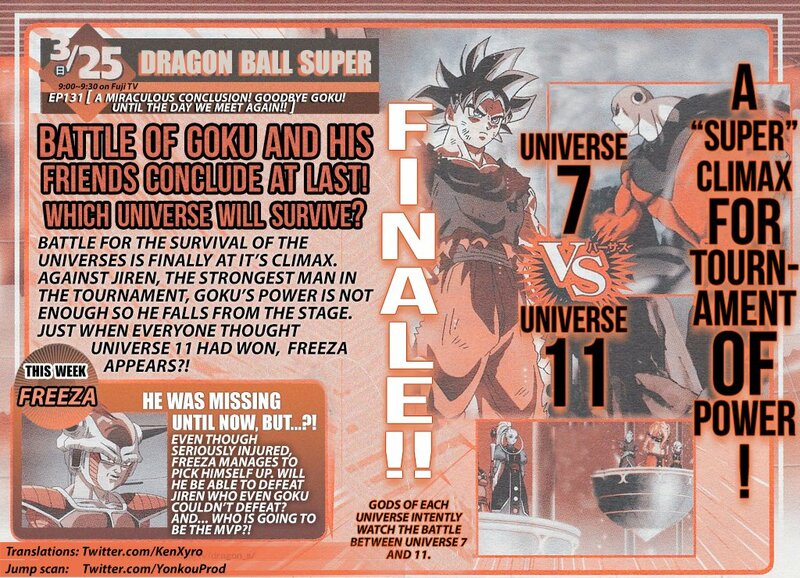 Still, the finale for the series is coming, and a synopsis of the episode has been posted online. In last week's episode, fans learned that Goku loses to Jiren when he is forced out of the ring, spelling defeat and annihilation for universe 7. Just as all seems lost, Frieza appears to save the day. The cliffhanger has fans wondering if Frieza will save universe 7, or if he has a more sinister plot in mind. An advertisement for the follow-up episode has been circulating in Japan, and a translation of the ad hit Twitter courtesy of KenXyro. The translated ad can be seen below. "Battle for the survival of the universes is finally at its climax," reads the ad. "Against Jiren, the strongest man in the tournament, Goku’s power is not enough so he falls from the stage. Just when everyone thought Universe 11 had won, Freeza appears?!" The final episode of the series, entitled “A Miraculous Conclusion! Goodbye Goku! Until The Day We Meet Again!” premiers on Saturday.